Ask Charles Cherney - Question #5 - What are the neighborhoods of Somerville, MA? So, what are the neighborhoods of Somerville, Massachusetts? Good question! Unlike the city of Cambridge, which has thirteen named neighborhoods designated by the city, Somerville has no such official neighborhood list. After doing my own research, I came up with a map of the neighborhoods of Somerville which includes seventeen named neighborhoods. My map appears below and you can access an interactive version of it at SomervilleMAneighborhoods.com. Boundary lines for these neighborhoods is subject to debate, as are a few of the neighborhood names, such as Powderhouse. I get that. What is undeniable is that Somerville, like Cambridge, features an incredibly interesting collection of neighborhoods. 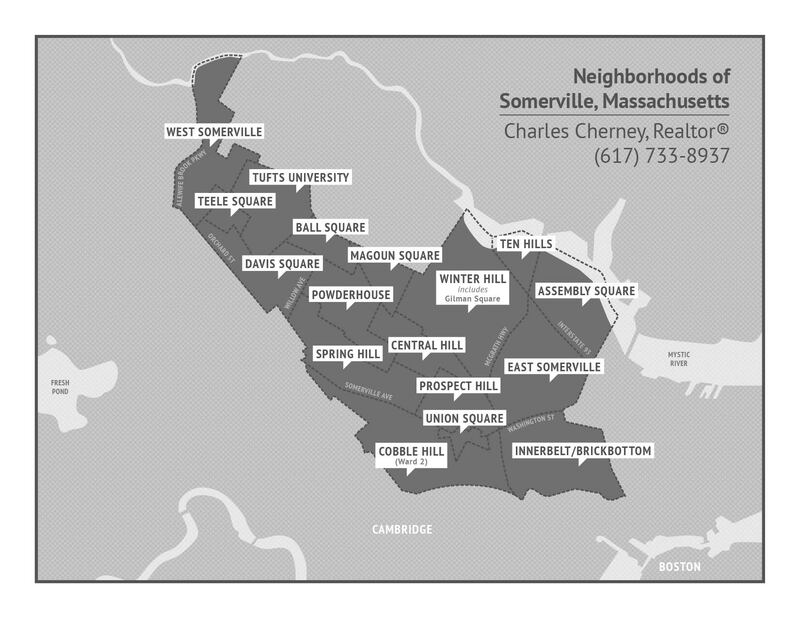 There are not too many cities the size of Somerville that can lay claim to seventeen neighborhoods! I have really enjoyed getting to know Somerville over the last twenty years. When the weather is nice, I like to explore the neighborhoods on my Vespa. Now that's a great way to see the city!